More than 14,000 Jews and others were massacred by the Nazis in Simferopol, Ukraine 70 years ago. Relatives remember the horror. 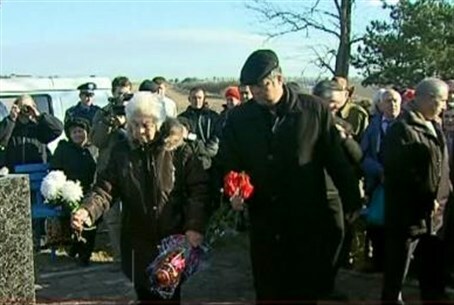 Relatives of more than 14,000 Jews and others massacred by the Nazis in the Ukrainian city of Simferopol 70 years ago gathered Sunday to remember the horror. They observed a moment of silence, held a march and erected a monument in memory of the victims, as reported on the Arutz Sheva Russian site. The Nazi regime carried out one of the largest wartime massacres in Simferopol, murdering more than 20,000 residents, most of them Jews. On December 9, 1941, at least 14,300 Jews and others were killed. Deputy Parliament Chairman Grigori Iyoffe said, "Today, when Nazism is raising its head, memory is our only weapon. Only in this way can we remember and not forget what happened here 70 years ago."